OK, the name doesn’t exactly roll off your tongue. In fact it’s impossible to say without sounding like you took a bite of a double-thick fluffernutter sandwich. Don’t let that put you off. Call it “HappyMagicFontFun” if you need to. I’ll stick with “FontStruct”, at least until I sprain a cheek. For my first effort, I was inspired by the bricks (and my own need for quick gratification), to make a dingbat font. Something about the idea of constructing graphics with bricks made me think of the 8-bit video games of my youth. Those amazingly simple graphics mesh well with my amazingly simple drawing skills. To commemorate the 30th anniversary of my favorite video game for the Atari 2600, Adventure, I created a font called Robinett (after the creator of Adventure, Warren Robinett). It is a collection of the graphics from the game. I recreated the various dragons, the key, the magnet, the bat, the secret message, etc, bit by bit. I tried to even make a single glyph that was a whole castle, but FontStruct wouldn’t put up with such craziness. The bigger the castle got, the slower my saves grew, until finally I couldn’t save changes at all. In fairness to FontStruct, the full castle glyph contained thousands of pixels. I got around this problem by chopping the castle into six pieces, and attached them to the numbers 1-6. To build a castle you center align, type 123, return, 456. A little baseline shifting and kerning is needed to fit the pieces together snugly. Robinett needs a crazy tall text frame, due to height of the secret message glyph. 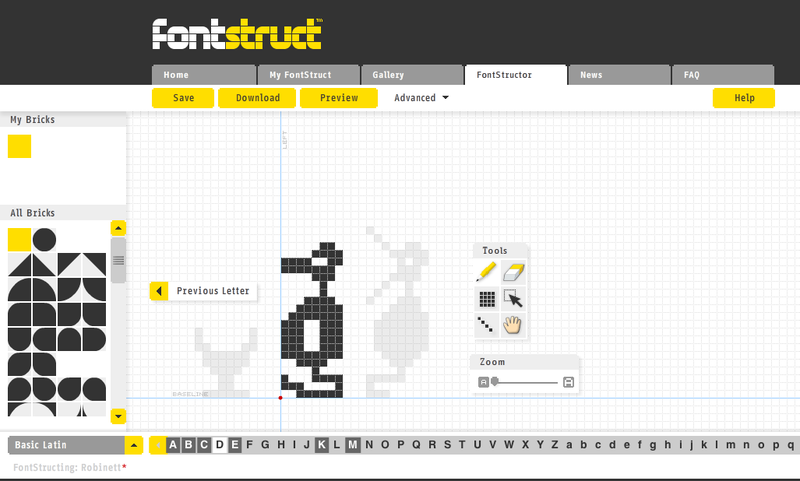 As good a tool as FontStruct is, I think it’s even better marketing. FontShop is a company that gets Web 2.0. They hit on every ingredient in the formula for engagement: figure out who your customers are, give them something to free and easy to play with, let them share with each other, be not evil about the legalities, and gently remind users that you also have cool stuff for sale. Your customers become your marketers, driving more people to your site. Hey, it worked on me. Having this tool at your disposal does not mean you are a type designer any more than having Dreamweaver makes you a Web Designer. There’s no “Apply Years of Experience” button or “Keenly Discerning Eye” tool. There’s not even hinting to make things nicely kerned. You’re free to make a horrible font. And probably a lot of people will. But constructing, excuse me, FONTstructing an original typeface pixel by pixel is a labor of love. That time committment will weed out a lot of FonTourists. So I think you’ll get a lot of true typeophiles, ‘structing their stuff for all to see. There’s no denying it’s cool seeing your font moving in next door to the Goudys and Baskervilles in your typeface menu. Who knows, if you keep at it, maybe you’ll make a future version of the list of the Top 20 Most Important Type Designers of All Time. The options you requested actually do exist, but you need the magic dot to access them. It’s hard to beat Jeff’s comment, so I won’t even try. Nevertheless, I wanted to commend you on both your Fontstruction and remembrance of the Adventure anniversary! …so you wouldn’t call this the holy grail of font creation?